This short but fascinating book works as both an illustration of how scientific ideas advance and an engaging focused history that stretches from Newton, whose work crowned the scientific revolution and helped inspire Europe’s Age of Enlightenment, to Einstein, who spent the WWI years absorbed in his nascent theories of relativity which changed the way we look at the world and made possible most further developments in science and technology. Framing the book’s story is the hunt for a missing planet, known as Vulcan (not Mr. Spock’s planet, unfortunately). In 1846 Urbain Le Verrier, a French scientist, used the mathematics of Newton's theories of gravity to predict the existence and location of Neptune, which was still undiscovered, based on slight anomalies in the orbit of Uranus. With almost perfect accuracy, Le Verrier was able to tell skywatchers where to point their telescopes and several found the planet immediately, a highly exciting moment in physics and astronomy that was downright inspiring to read about. 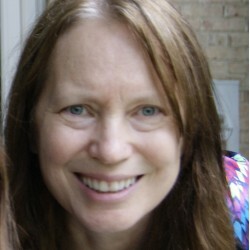 So when Le Verrier used Newton’s formulas to postulate the existence of a planet between the Sun and Mercury based on anomalies in Mercury’s orbit, everyone assumed he was correct--both Newton and Le Verrier had proven themselves almost god-like in their insights after all. Scientists spent 50 years looking for the planet they called Vulcan--some actually thought they had found it and no one was willing to jettison Newton’s universal law of gravitation--until 1915 when Einstein used the theories of relativity and the bending of spacetime by gravity to prove that Vulcan doesn’t, and couldn't, exist. 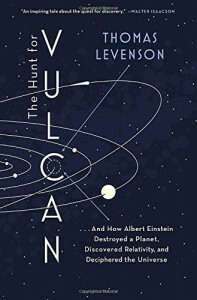 With biographical sketches, some history of the era, and accessible explanations of the involved science, The Hunt for Vulcan is informative and highly entertaining.